OMG!! What a week! The Cinemalaya week was really fun and memorable! Of course, because I had you guyz with me (awww..). I enjoyed the thrill of commuting and going to CCP. That was my first time to commute going there. Because of you guyz, I discovered that those orange jeeps (that looked like school buses to me) can actually bring us to CCP. Thanks a lot! haha. 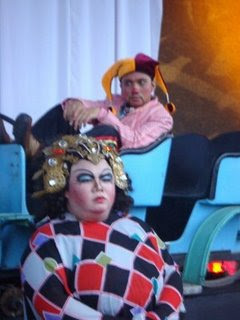 Anyway, do you guyz remember that fat and creepy-looking lady in costume? Oh, nothing much. I just wanted to share that she scared me a lot! You noticed it, didn’t you? I don’t know why, she just looked so real that she really scared me. When she looked at me, it seems like wanted to eat me alive! That was Freaky!! During the program proper, I enjoyed the productions they prepared. They were just sooo amazing. I admire them so much that I have established this dream of becoming one of the CCP’s performers one day. Who knows? Maybe someday I’ll be able to make it. Don’t worry guyz, if that happens, I’ll invite you to watch my stage plays for free. haha. Im such a dreamer! Oh well, till next time guyz. Hoping to have another great bonding time with all of you. I love y'all!!mua! !